Have you seen Storage Wars? It’s the reality show where a cast of characters bid on the unseen contents of abandoned warehouse lockers. First aired in 2010, it quickly became A&E’s most popular show. Who would have ever imagined? Over 5 million people in lounge chairs every Tuesday watching America sort out its forgotten stuff. While the magazine Slate claimed Storage Wars was ‘trash TV’, its is popular, raising the question: Why are so many so fascinated by the apogee of America’s growing piles of junk? Why is junk-voyeurism so magnetic, particularly as most of us know all too well, too much stuff is neither good for ourselves nor most definitively not for the planet? Is America all, and only about stuff? In a liberal economic democracy, more stuff means more growth. So yes, in this framework, constantly buying is a big deal. Spending is an even bigger deal in the United States than most countries, as 70% of its economy is fueled by consumer spending. Between June and September alone, Americans spent an incredible $14.1 trillion. Over 60% of which went to buy consumer durables, or stuff. America buys more stuff than it can afford, most of us know that, and soaring levels of credit card debt don’t lie. Americans buy more stuff than they can even fit in their own homes. With nowhere to put the growing piles, a new industry was born: storage lockers. Since 1961 when the first personal storage company opened its doors, the storage industry has quickly evolved into one of America’s highest growing sectors. 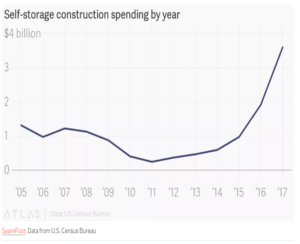 Surprise, surprise: growth of the personal storage industry is oh so similar to that of consumer debt and, wait for it…. Black Friday sales. The correlations are a bit superficial, I admit. But together these trends verily scream: we buy stuff we don’t need at prices we can’t afford… the very hymnal of Black Friday. We all have good reasons to want a great deal on something we need, and things wear out. It’s not about buying things, but over buying. There are loads of more and better reasons not to load up on stuff we don’t really need (particularly if you want to avoid becoming 1 of 6 Americans renting a storage locker at an average annual cost of $1080). Beyond the wallet, there are many emotional reasons of personal well being to avoid the locker. Numerous studies show folks driven by material values are much less likely to be satisfied with life. They are less happy, more distressed, have higher levels of anxiety and depression. Prone to narcissism, drugs and alcohol abuse, they are more angry, scared and sad. Materialists fight more, steal more, cheat more, and are dirty in business. They have less empathy, like to manipulate, are often prejudiced, and have a tendency towards authoritarianism. And get this: materialism makes you less likely to recycle, conserve energy, and to give a damn about others and the environment. Consuming is an Act of Patriotism? If the consumer engineers — the very same who brought you the shopping crazy of Black Friday, Valentines, Christmas etc. – that encourage us to spend every-last and borrowed cent we have is not enough, in the immediate aftermath of 9-11, President Bush urged us to save America by getting out there and spending. 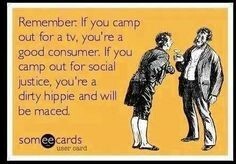 Does that mean camping out overnight for a $100 TV makes you more a Patriot than those who choose the environment and happiness over stuff? Are Consumers, like American Service People, to become the next inscrutable Patriots? (If that doesn’t rile up your sustainability Kaepernickian Reflex what would?). If this is how deeply consumption has scratched miserable and unsustainable on our lives, buckle up, I can’t even begin to imagine the dystopian version of Storage Wars. Want to discuss this article with me, drop me a line, and we can podcast it!